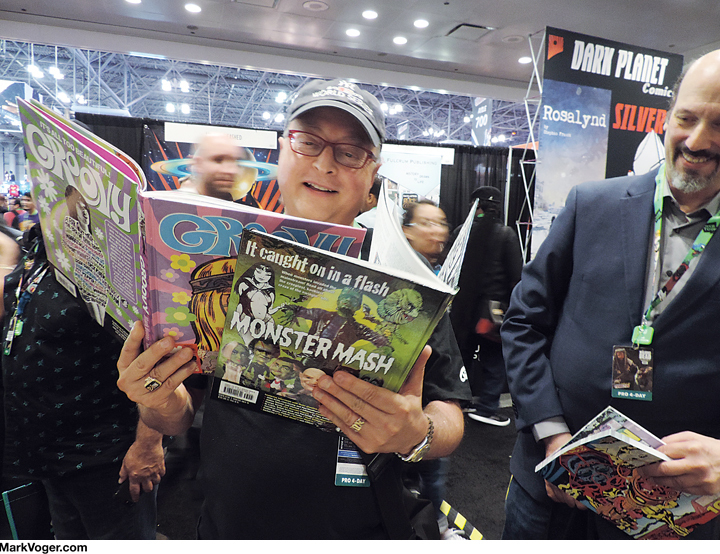 Blogger’s note: “Groovy” world-premiered at the New York Comic Con held Oct. 5-8, 2017, at Javits Center in Manhattan. I was on hand at the TwoMorrows booth on that Friday, Saturday and Sunday to scrawl my name on advance copies. Following are my memories of my first day at the con: Friday, Oct. 6, 2017. There I was at the train station, all set for my first of three days at the New York Comic Con. 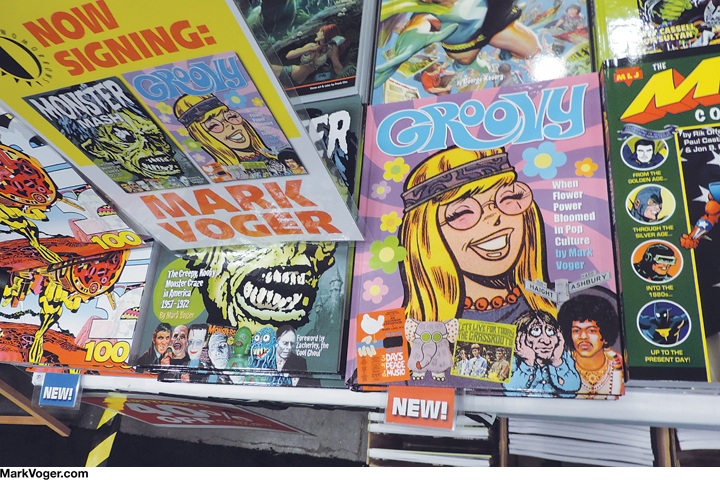 My shiny new enlargement of the “Groovy” cover on poster board was at my side. 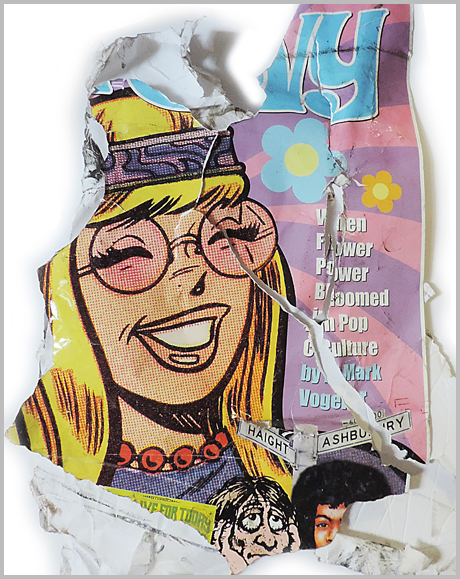 All that was left of Hippie Girl. An express train flew by at, I’d judge, 300 MPH. I watched the poster get sucked under the train by powerful centrifugal force. It was spinning at, I’d judge, 300 RPM. It seemed to evaporate into thin air. The only trace of it left behind on the tracks was Hippie Girl’s face. Well, most of it. Anyways, I slogged to Javits, found my way to the exhibitors’ entrance, and hooked up with my new best friend for the next three days, Eric Nolen-Weathington of TwoMorrows Publishing. Soon came the moment I was waiting for: I saw “Groovy” for the first time. The crops were perfect, the fonts all worked like a charm, and — something that was important to me — the endpapers were verrrry groovy. The TwoMorrows booth was on a corner — a good thing — and next to the Jack Kirby Museum & Research Center booth manned by the funny and fun Rand Hoppe and Lisa Rigoux-Hoppe. Eric and I were soon joined by writer-educator Keith Dallas, who spearheaded TwoMorrows’ “American Comic Book Chronicles” series of hardbacks examining the history of comics, one decade at a time. Keith said he originally pitched a one-shot ’80s book, but then one thing led to another. He is currently working on a college class about graphic novels, and asked if I had any suggestions. The book I suggested isn’t a graphic novel per se, but it’s one of the most powerful examples of communicating in the comic-book form: “I Saw It” by Keiji Nakazawa. Comic Con was crazy! Too many people. Sometimes, it was downright claustrophobic. Seeing so many people in costume — you know, that thing they call “cosplay” — made me ponder how far comic book conventions have come. They used to be relatively modest affairs that were all about the comics and the artists. They’ve morphed into spectacles that I would call “character” or “media” conventions with a strong comic book component. I’m not ragging. I think it’s healthy and cool. Plus, it’s hilarious seeing a fat Captain America walk by eating chicken fingers and French fries. Another visitor was Captain Zorikh, a character I remember from the Big Apple Con days. I was glad to see that Zorikh — self-described as “The People’s Entertainer” — was still living the dream. Still wearing the many-buttoned jacket, still doing the martial arts, still updating his manuscript for “Captain Marvel Culture,” his long-planned book that will prove how all of popular culture sprang forth from the superhero introduced by C.C. Beck and Bill Parker in 1940. This is a guy who will never hang it up. I salute you, Captain Zorikh. Michael E. Uslan, bless him, checks out “Groovy” and “Monster Mash” simultaneously. Now, that’s product placement. A reader named Alan (left) purchased “Groovy,” and asked me to take his photo to put on my website. Here you go, Alan, and thanks. At right, Captain America wields his shield. I love this candid of Cornelius checking his phone and Uhura doing the Spock hand signal. 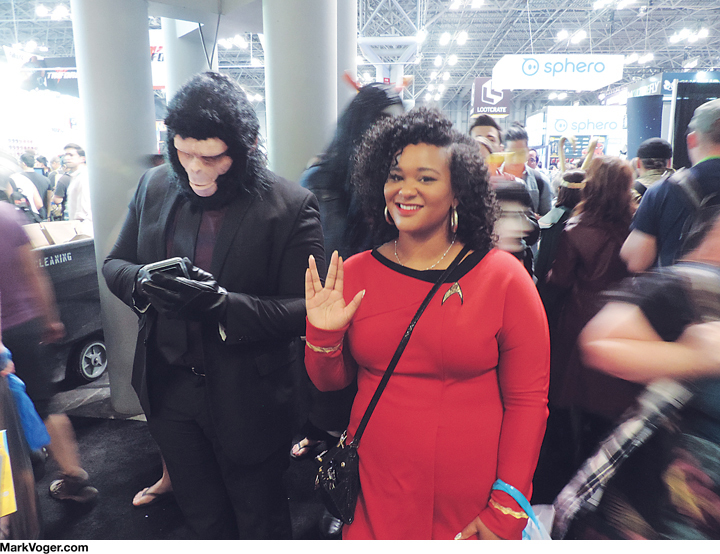 Read about Saturday at the 2017 New York Comic Con HERE.